DBS&A supports landfill operators and hazardous waste managers by providing regulatory, scientific, and engineering solutions at hazardous and municipal solid waste landfills, land disposal units, waste isolation facilities, and mine sites. Our experience includes siting, permitting, design, construction oversight, quality assurance, and monitoring for facility expansions, permit modifications, and closures. We have shepherded high-profile sites through all phases of state regulatory and Environmental Protection Agency (EPA) approval. We maintain a superior record of providing value when considering clients’ expectations of cost, quality, and schedule. Our public and private sector clients include municipalities, counties, private operators, the Department of Energy, and the Department of Defense. DBS&A is an international leader in the design of evapotranspiration covers (ET covers) for arid regions, also referred to as alternative covers, store-and-release covers, or phytocaps. Based on site-specific conditions, ET covers can provide improved cover performance and lower construction costs, as well as reduce long-term maintenance concerns. For a detailed description of our experience with ET covers, click here. DBS&A has gained regulatory approval of this design by demonstrating its success in the U.S. and recently put this experience to work internationally. DBS&A has significant experience performing compliance monitoring at landfills for groundwater quality, leachate, and landfill gas emissions. We have written monitoring plans for groundwater, methane, and leachate and have implemented the plans by installing groundwater monitor wells and landfill gas monitoring probes. We understand the latest protocol for statistical analysis of environmental monitoring data and use these procedures to lower our clients’ monitoring costs by developing reduced indicator parameter lists for monitoring. All sampling and analysis methods follow U.S. Occupational Safety and Health Administration (OSHA) standards for health and safety and conform to accepted state, federal, and industry-standard quality assurance/quality control (QA/QC) procedures. DBS&A performs construction quality assurance (CQA) oversight and testing for solid waste facilities, from liner installation through final cover placement. DBS&A has liner installation inspectors on staff who are certified under the Geosynthetics Certification Institute Inspectors Certification Program. For landfill liner and cover construction, we prepare soil and liner quality control plans (SLQCP) that are approved and implemented. We also complete liner installation QA/QC testing certification reports for state review and approval. DBS&A works with clients to gain an understanding of reclamation intentions and develop successful closure and revegetation programs. We have experience preparing all of the documents necessary to close landfill operations pursuant to current regulations. We can assist with closure and post-closure design and monitoring, including determining goals and detailed methodology of activities necessary to stabilize potential contaminants. We are knowledgeable of closure and stabilization requirements pertaining to components that could potentially lead to degradation of waters of the state. Closure components and major elements of site stabilization may include reshaping and regrading, covering, placing of growth medium, and applying soil amendments. We perform germination studies to assess the ability for native plant species to establish in the proposed growth medium, develop revegetation plans, and study plant uptake. DBS&A has performed cover design for landfills with waste types ranging from construction and demolition debris (C&D) to municipal solid waste (MSW) through radioactive and mixed wastes. DBS&A staff members have been awarded patents for special applications of water balance covers, including a patent for an ET cover developed in partnership with the U.S. Department of Energy. Our independent research efforts have led to development and regulatory approval for a simple and cost-saving alternative to standard landfill and hazardous waste covers—ET covers. The use of ET covers is expanding due to their high performance and low maintenance costs. DBS&A assists our clients to gain ET cover regulatory approvals across the western U.S., and we are working toward regulatory acceptance in a number of states in Australia. 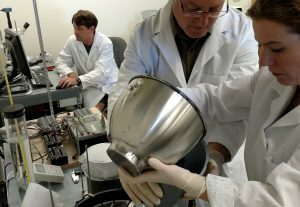 We continue to develop and implement new techniques for soils testing, artificial recharge, and passive hydraulic control of contaminants in the subsurface. Our recognized experts in design and implementation of water balance covers, including applicable soil testing and modeling, have authored or co-authored many white papers and have been asked to present to international audiences. DBS&A’s Soil Testing and Research Laboratory is a leading facility for specialized tests for determining the hydrologic properties of soil and rock and for the research, development, and implementation of novel technologies and instruments to aid solid waste facilities. 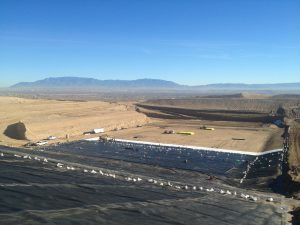 Understanding site soil conditions, such as infiltration rates, seepage, leakage, and contaminant transport, can be invaluable in optimizing waste management projects. Developing an efficient soil management plan implemented over the facility life is key to landfill cost control and profitability. Therefore, DBS&A works with our clients to identify on-site and, if necessary, off-site soil borrow material sources for use as daily and final cover materials. Our laboratory services for evaluation of borrow material properties include saturated and unsaturated hydraulic conductivity, particle size, and bulk density. Due to our laboratory’s close proximity to DBS&A’s corporate headquarters, our design engineers are able to closely monitor each project’s progress. More about DBS&A’s laboratory services. Computer modeling is one of the most advanced methods available to gain an understanding of past, present, and future movement of water and contaminants in the hydrologic cycle. 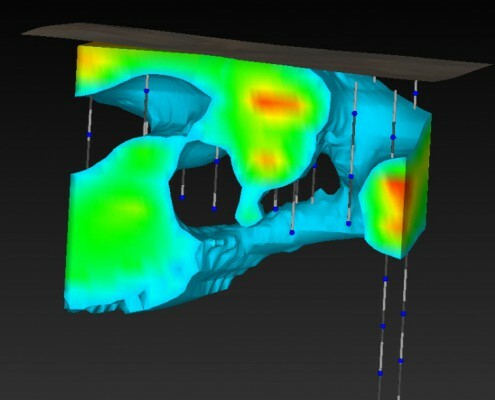 Our models can take the form of simple analytical solutions and/or state-of-the-art and highly complex numerical computer codes to simulate the subsurface flow and transport within a small area or through geologically complex aquifer systems over an area of hundreds of square miles. DBS&A performs all aspects of permitting associated with solid, hazardous, mixed, and radioactive waste landfills, from the initial siting through operation and closure permitting. 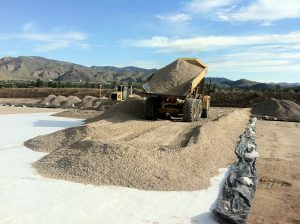 In addition to the standard permitting, our projects have involved inventories and reporting needed to comply with U.S. Title V air emission requirements. We have modified existing permits for expansion and efficiency gains and have also performed client support and negotiation services. DBS&A routinely prepares construction drawings, technical specifications, and bid documents to allow for selection of a qualified contractor for construction. Our landfill engineering designs have gained high marks with regulatory agencies and withstood the tests of construction implementation with contractors. 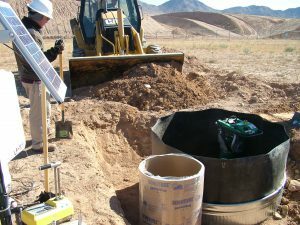 In many states where DBS&A operates, our landfill liner and cover designs include slope stability analysis for the seismic risk at a particular site location. 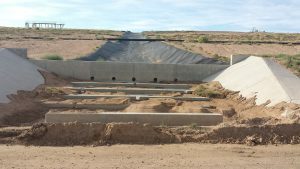 We design stormwater control systems that provide for progressive build-out as cells are developed over the life of the landfill. Our engineers take care to meet all federal, state, and local stormwater design requirements. In addition to helping clients navigate regulations regarding stormwater runoff (including the EPA’s National Pollutant Discharge Elimination System requirements), our engineers design stormwater management and conveyance systems. DBS&A develops plans and designs for diversion, collection, and control facilities, including stormwater ponds, liners, culverts, and emergency spillways. 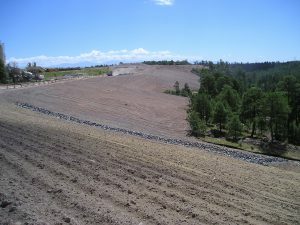 In addition, we develop plans and designs for grading and erosion protection, including runoff calculations to minimize flooding, infiltration, and contamination. Our services also include water sampling, infrastructure monitoring, and preparation and implementation of Storm Water Pollution Prevention Plans (SWPPPs). DBS&A also assists clients in modification of Federal Emergency Management Agency (FEMA) flood mapping through the Conditional Letters of Map Revisions/Letter of Map Revision (CLOMR/LOMR) process. This process allows for facilities to revise the National Flood Insurance Program (NFIP) map to allow the placement of fill outside an existing regulatory floodway, which may allow for additional expansion and operational alternatives a client may not have previously considered.